The movie was shot in 36 days. Crew or equipment visible: When Daniel comes in to speak with Farhad after fixing his lock, two members of the production crew can be seen attempting to hide behind one of the store shelves in the bottom-left corner of the frame. Graham: It's the sense of touch. In any real city, you walk, you know? You brush past people, people bump into you. In L.A., nobody touches you. We're always behind this metal and glass. I think we miss that touch so much, that we crash into each other, just so we can feel something. In a drama strikingly reminiscent in style and tone of P.T. 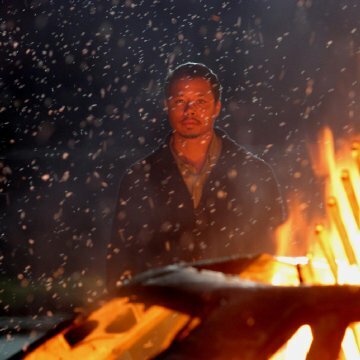 Anderson's film Magnolia (1999), the narrative in Crash shifts between 5 or 6 different groups of seemingly unconnected characters, whose relationships to each other are only revealed in the end. Not to be confused with the David Cronenberg feature of the same name, this Crash is the feature-length, studio-released directorial debut of veteran Canadian TV writer/producer/director and two-time Emmy-winner Paul Haggis. An in-depth exploration on the themes of racism and prejudice, cause and effect, chance and coincidence, and tragedy, "crash" is a metaphor for the collisions between strangers in the course of day-to-day existence. Set over a 24-hour period in contemporary L.A., it is a social commentary on the interconnectedness of life in the big city. 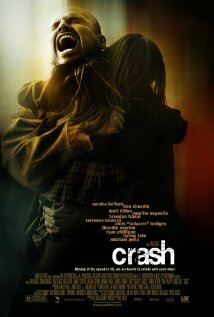 Crash features a top-notch ensemble cast which includes: Sandra Bullock, Don Cheadle, Matt Dillon, Jennifer Esposito, Brendan Fraser, Chris "Ludacris" Bridges, Loretta Devine, Thandie Newton, Ryan Phillipe and Larenz Tate. All put in superb performances in a tight script which is at once gritty, heartwarming, shocking, tragic and witty, and which will ring true with viewers of all demographics. Centering around two disturbing car accidents, a carjacking, vicious workplace vandalism, and the suspicious shooting death of one police officer by another, the drama is set against the backdrop of a racist LAPD and Los Angeles justice system. Action shifts between the various characters, whose lives collide with each other in unpredictable ways as each faces their own moral dilemma, and tries to cope with the consequences of their resulting decision made or action taken. Each of the dozen or so main characters undergoes some type of a personal metamorphosis as the various story lines head toward a striking, common conclusion, which succeeds at being both cathartic and unsettling. Crash is backed by a solid and varied, original soundtrack and excellent cinematography. Sweeping, wider shots alternate with disjointed camera angles which convey the chaos and confusion of the characters and the unpredictability of life. Occasional lingering close-ups -- on occasion without sound -- capture the actors' facial expressions, which suitably detail key moments of the characters' aching pain, fear, anger, bitter anguish, remorse or grief, far better than any dialogue could. This breathtaking film is destined to be a critical smash and box-office hit. Five stars.